Eddie South (Edward Otha South) was an American jazz violinist and bandleader born (in Louisiana, Missouri) on November 27, 1904. He is known for having achieved legendary status only after he died. It has been said that had he not been black, he would have chosen a career in classical music. He began his violin studies at a very early age and by age 10, was studying at the Chicago Music College, from which he graduated, possibly in the year 1921. He entered the world of jazz in 1921, with assistance from Darnell Howard (a leading jazz violinist of that era), playing with Erskine Tate and Mae Brady. 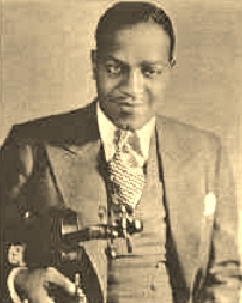 In 1923, he was musical director of Jimmy Wade’s Syncopators in Chicago. South's first recording came in that same year with Wade's Moulin Rouge Orchestra. He formed his own band, the Alabamians, in 1927. The group was named after the place they performed in, the Club Alabam, on the corner of Rush and Chicago Streets, a section of Chicago then known as Chicago's Bohemia. Along the way, South also worked with bandleaders Charles Elgar, Henry Crowder, and Freddie Keppard, as well as bassist Milt Hinton, and pianist Billy Taylor. He toured Europe with this band between 1928 and 1930. Having arrived in Europe, he also studied at the Paris Conservatory. While in Budapest, Hungary, in 1929, South took a liking to Gypsy (Roma) music and eventually made it a part of his improvisations. It is well-known that during a tour of Europe in 1937, he performed and recorded with jazz legends Stephane Grappelli, Michel Warlop, and Django Reinhardt (who famously played with his two usable fingers only) in Paris. Among the tunes recorded was Bach's concerto for two violins - in jazz style, of course. Besides recording, he also played on radio and television. From 1947 to 1949 he played in the big bands led by Earl Hines. South also worked in New York and Los Angeles. Nevertheless, despite the exposure he got from working with the biggest names in Jazz, as far as the public was concerned, he stayed unknown for the remainder of his life. It has been said that his playing style suffered from the strictures imposed by his classical training – it didn’t swing sufficiently. He recorded for the Chess and Mercury labels among others. One of his last recordings was produced in 1951, though he last recorded in 1959. YouTube has several audio files of his playing, one of which you can hear here. That fascinating recording of the Bach Double concerto (for two violins) he did with Stephane Grappelli can be heard here. South died in Chicago on April 25, 1962, at age 57.